Those of us living in the westernized world like to think we are more advanced or developed than those living in the eastern world. Yet time and time again we are proven wrong. One common example is the use of foods to cure or control ailments. We tend to eat our foods for enjoyment whilst Eastern people have been using foods for thousands of years to treat ailments and continue to do so today. One such example is the tropical Mangosteen fruit. The Mangosteen is an ultra-tropical tree that requires a wet, lowland tropical climate. It probably originated in Southeast Asia but is now grown in India, the East Indies, Indonesia, Brazil, Central America, Hawaii and other tropical areas. And to think I had never heard of it. The tree fruits twice a year bearing dark red or yellow fruit with a thick tannic rind (up to 8mm). The inside of the fruit is pinkish in color and divided into 4 – 8 segments. The fruit is very sweet and juicy. As the fruit is often difficult to find in stores the most popular way to consume mangosteen is as a juice. The Chinese have dried and powdered the mangosteen fruit rind for years and used it to treat dysentery, cystitis and chronic diarrhea. They also make it into an ointment to treat eczema and other skin disorders. Malaysians use the ground leaves to treat circumcision wounds and a root extract to regulate menstration. The Philippinos use the leaves and bark to treat thrush, dysentery and urinary problems. A substance known as mangostin is found in the mangosteen fruit rind and has a very high antioxidant value. 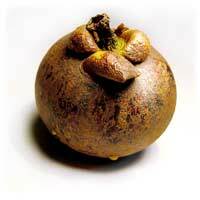 As we know antioxidants help to reduce inflammation and have valuable healing properties which are the main features making the mangosteen fruit so interesting in the treatment of eczema. In fact the fruit of the mangosteen is often referred to as one of the most powerful natural antioxidants yet discovered. Although the body can only absorb so many antioxidants and excretes the rest it doesn’t hurt to have as many as possible to help reduce internal inflammation and therefore reduce the overall symptoms of conditions such as eczema. An easy, natural way to help control eczema. And to think I thought the strawberry was the best fruit for us to eat. I only hope the mangosteen fruit tastes as good as a strawberry.